Here's a vintage date roll candy recipe that you simply must try. Some call it date loaf candy, but it's also known as date nut candy. It's amazingly yummy no matter what you call it. Just read the rave comments below! Made from dates and all-natural ingredients, it's simply formed into a roll and sliced for serving. 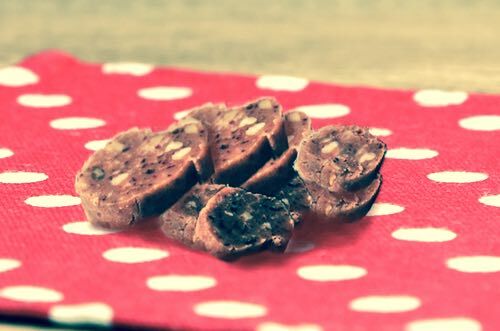 Here is an old family recipe for a delicious candy made from dates and nuts. It was always called Date Loaf Candy at our house. Cook to soft ball stage. Add 1 cup chopped dates. Stir constantly until dates cook to pieces. Remove from heat. Beat until creamy. Pour on a damp cloth; shape into roll. Cool and cut in slices. My mother used to make this date loaf candy too, back in the 1950s when I was a kid at home at Christmas time. I have craved this recipe for years and couldn't find it in her books. Thank you so much. I won't wait till Christmas to make this one! —Frankie C.
Thank you SO much for sharing what is one of my favorite memories of my Mom who has been gone since 1963. This is the most delicious candy in the world! —A. My Grandma kept this recipe for date nut candy roll and never gave it out. Thank you so very much for finding this, as it is exactly what she used to do. I have passed this candy recipe on to my sister, and I hope she makes it; doubtful but hope so. I will be making this at Christmas time also. I don't recommend making it in the summer as the temperature outside has a lot to do with the candy making and how it will set up or not set up. There's a no-cook divinity that has this problem too. Thank You so much for putting this out there for us, it will be a treat for the entire family. I can't believe that my grandma took all the recipes with her to her grave! Thank Heaven for the Internet and the things that we can find here! —Anon. Boil sugar, milk, and cream of tartar until it forms a soft ball in water, stirring occasionally. Add butter, dates and cherries and beat until the dates are well mixed then add nuts. Continue beating until too thick to stir. Turn out on damp cloth in long roll. Roll up and let stand until hard. Slice about 1/4 inch thick. Cook milk, sugar and butter over medium heat until it forms a soft ball when dropped into a cup of cold water, about 234 degrees F. Add dates, nuts and vanilla extract. Beat with a wooden spoon until creamy. Put a clean cup towel on the counter or butter a sheet of wax paper. When the candy is cool enough to handle, roll the mixture into the towel or wax paper in a log shape. Refrigerate overnight and slice when chilled. Makes 20 servings. 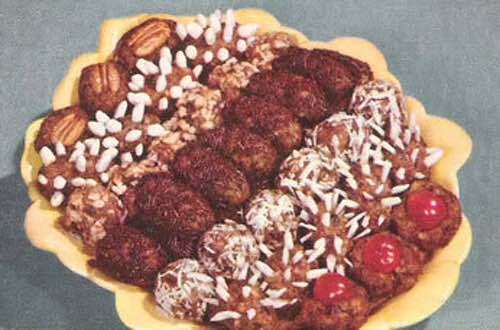 My mother also made this candy, but put jellied pineapple, cherries, etc. in it. I had been going through her recipes for years and couldn't locate her version. Thanks! —Anon. This year for Christmas dinner, we are having pot luck. We are supposed to bring our favorite Christmas "memory" dish. My parents are gone now, and they used to make this date roll candy recipe every year. I have looked for the recipe, and have found several, but, they were not the right one. This is it. Thanks. —Anon. The Best Christmas Candy Ever! I also had this more than 60 years ago at Christmas and had lost my mother's recipe. Thanks for making my Christmas truly memorable. —Tammy L.
1. Wash and dry on towel 1/2 cup uncooked, pitted dates and 1/4 cup uncooked, dried apricots. 2. Put dates and apricots through medium knife of food chopper with 2/3 cup seedless raisins and 1/4 cup shelled nuts of choice. 3. Put ground fruit mixture into bowl and add 1/4 cup PET Evaporated Milk, 1/2 teaspoon grated orange rind, and 1/8 teaspoon salt. 4. Mix thoroughly until all milk is absorbed. Chill in refrigerator. 5. Shape into round or oblong patties. Decorate with shelled nuts or halves of candied cherries, or roll in chocolate decorettes (chips) or finely chopped nuts or shredded coconut. Patties may also be studded with puffed rice, or strips of blanched almonds. Note: Dried, pitted prunes can be substituted for the dates and dried or pressed figs for the apricots. This is an easy to make and delicious candy that's a little different from any other. Butter a 12x15-inch sheet of aluminum foil and dust generously with confectioner's sugar, then set aside for later. In a saucepan over medium-high heat, mix together the sugar and evaporated milk. Stir frequently and bring to softball stage of 235°F. Stir in dates and nuts; allow mixture to cool. Form the candy into a roll about 1-1/2 inches in diameter and wrap in the prepared aluminum foil; refrigerate until firm. Slice thinly with a knife dipped in hot water to serve.